Reference number for this case: Mid-Oct-54-Marseille. Thank you for including this reference number in any correspondence with me regarding this case. AVIGNON. - In early afternoon yesterday Friday the population of Fontaine-de-Vaucluse, was in turmoil. Indeed, a "white disc" was hovering slowly over the small town and one could clearly distinguish it with good binoculars. This white disc was surmounted by a spherical cap of the same color. The lower circular edge carried intermittently two powerful fires varying from white to purple color, passing by the red color. Caritat Air Base (Vaucluse), alerted, immediately scrambled two jets which soon appeared, and after two turns on Fontaine-de-Vaucluse, they took altitude and dove on the "disc". The radio installed on the jets was in communication with the base, it announced that the craft was in sight, it was chased, but it escaped because its speed was greater than theirs. From Vaucluse, one could clearly see the disk go away fast, pursued by the two jets. Mulhouse. - A trader in a car last night in the company of a friend, between Niffer and Kembs, suddenly saw in the sky a luminous machine in the form of an oval fireball. The latter, according to the trader, followed a large "8" in the sky, moving at a tremendous pace and at an altitude of about 300 meters the craft, which was preceded by a long trail of light, changed color passing from orange to white color, then went to the southeast. Martigues. - An 8 year old child, who was with his mother and aunt on the road in the hamlet of Saint-Pierre, near Martigues, saw in the sky an elongated luminous machine, from which, she specified, a sort of fireworks came out. The parents have certified to the statements of their child. Calais. - A baker boy of Calais said he had seen at 3:40 a.m., at the place called "St. Pierre Halte" on the road to Saint-Omer, a yellow and shining craft landing on the railway. The oddly shaped object was, according to the baker, two meters high and four meters in diameter. Nimes. - Two people saw last night, returning to their home, a few kilometers north of Nîmes, a greenish glow in a field. They approached and noted the presence of a vehicle identical in all respects to a rugby ball and appearing to rest on crutches. The strange apparatus suddenly rose in the air while emitting a low noise and gradually taking an orange hue. Graulhet. - A barrel-maker from Graulhet stated to have seen late yesterday afternoon, at high altitude, a silver craft heading toward the northwest, he first thought it was a jet plane, but discerning no contrail, the barrel-maker fetched binoculars and distinctly saw a broad flexible disc that undulated on itself while moving at a high speed. That's when the craft seemed to explode in flight. A silver ball, one meter in diameter, escaped the mass and continued on his way, soon disappeared from view, while the rest of the craft fell into pieces similar to sheets of various sizes that hung in the sky and some of which clung to telegraph son. Fifteen people have testified to this singular event and material fragments were collected. They were in the form of agglomerated silver filaments and crumbling to the touch. Melun. - Near Montargis on National Road No. 7, a resident of this city, said he saw in the sky a yellow mass of rounded and very brilliant form. Marseille. - Two luminous craft flying high were seen in the sky of the Rove earlier this afternoon. Observers noted that these apparatuses were immobilized a moment and then resumed their flight. Draguignan. - Several residents of Draguignan observed towards the end of the afternoon, a luminous object crossing the sky at the speed of a meteor. Casablanca. - Workers of the military logistics of Casablanca stated to have seen this afternoon, above the city, a kind of phosphorescent cigar that, after gently going down like a dead leaf resumed its horizontal course at breakneck speed and eventually disappear. Angers. - A resident of the village of Méral (the Mayenne), said he saw in the sky, a bright orange ball which landed on the ground. The disc, with a flattened dome, of a diameter of five to six meters produced a blinding light, illuminating the countryside in a radius of 200 meters. The craft was transparent and inside, one observed a black shape. The disc remained like this for ten minutes, turned reddish, and quickly disappeared to the north. The observer then went to the place where the object had landed. There was, he says, a kind of brilliant cloud that fell slowly to the ground. Arrived at his home he noticed that his clothes were covered with a white layer of a slightly sticky material like paraphine [sic]. London. - The Ministry of the British Air does not believe in the existence of "saucers", "cigars" and other flying contraptions. While refusing to comment on the craft reported in France, official spokesmen stated that natural explanations are usually given to these phenomena in Britain and that only insufficient explanations let the mystery survive. No mysterious object was reported in the skies of Britain in recent weeks. 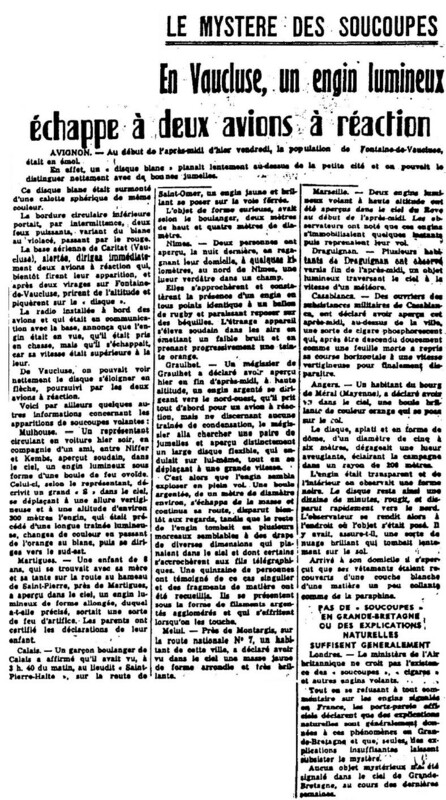 [cm1] Article in the regional newspaper Centre Matin, France, October 17, 1954. 1.0 Patrick Gross October 27, 2016 First published. This page was last updated on October 27, 2016.